The United Federation of Planets, in a nutshell, circa 2267. Not sure why the Klingons or Romulans were worried. The Enterprise transports a group of dignitaries to a conference regarding Coridan’s admission to the Federation. We meet the Vulcan representative Sarek, Spock’s father (Mark Lenard) who travels with his human wife and Spock’s mother, Amanda (Jane Wyatt). Spock’s relationship with Sarek and Amanda is strained, an important point when it’s learned that Sarek needs a blood transfusion from Spock to live, as he’s been hiding a heart condition. Meanwhile, a Tellarite dignitary is found dead and Kirk is stabbed by what appears to be an Andorian (really, an Orion agent cosmetically altered). 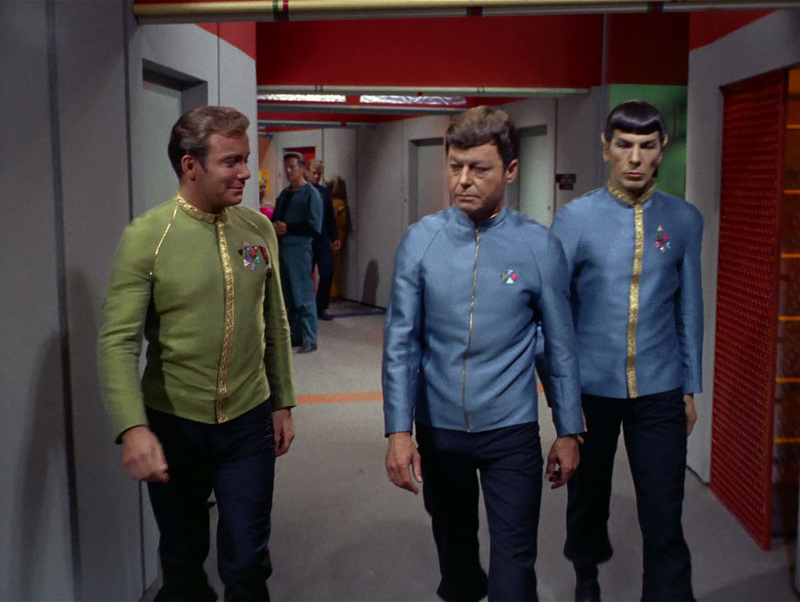 With Kirk in sickbay, Spock refuses to yield command and commence with the transfusion, so a wounded Kirk heads to the bridge to relieve Spock, hoping to fool him into undergoing the procedure. Spock leaves and McCoy begins the operation, while a weakened Kirk must command the Enterprise through a battle with unidentified aliens (who turn out to be Orions with mining interests on Coridan). Kirk’s tactical genius saves the day once again, and McCoy completes the operation, saving Spock and Sarek. The Lollipop Guild was a Federation member, apparently. Also, is that a space bong? Well, with a summary like that, you can see where there was a lot of plot and a lot of foundation. 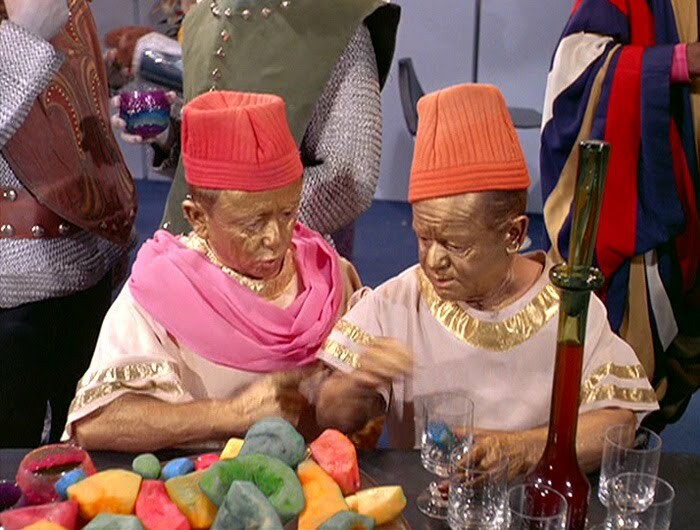 We’re introduced to the Tellarites and the Andorians — who, as a result, are later shown to be early members of the Federation — the Orions (beyond the slave girl stuff in “The Cage”) and, of course Spock’s parents. D.C. Fontana’s scripts were often written with continuity in mind as she commonly brought back an earlier enemy and fleshed them out (“Friday’s Child” and “The Enterprise Incident”). The Tellarites’ argumentative tendencies and the Andorians’ warrior traits are first shown here, too, and define both species in “Star Trek: Enterprise.” That relies on the somewhat hoary sci-fi crutch that all members of a race pretty much act the same (not to mention that they look the same and dress the same). But this is one of only three times Andorians appear in TOS and one of two times Tellarites do — and it’s the only episode where they’re not just sort of personality-less background dudes or henchmen. Meanwhile, Spock’s estrangement from his family is established here. It’s (ahem) a fascinating bit of backstory for one of Star Trek’s cornerstone characters, even though it’s not Earth-shattering (galaxy-shattering, Vulcan-shattering?) in what it means to the rest of the franchise. In other words, Spock’s backstory wouldn’t have, say, changed Federation history or anything. But it is good stuff. Not a lot of issues here. The Tellarite mask is pretty terrible, but whatevs. It is interesting that Spock won’t yield command when lower officers have been left in charge before (e.g. Sulu in “Errand of Mercy” or Scotty in like half of the third season). But that can mostly be explained by Spock’s sense of duty/logic with his pops around. Oh, and I wonder if Spock ever mentioned to Sarek that his identical twin happened to be a Romulan commander? Eh, it’s not their way, I guess. Now, there was that scene way back in “The Corbomite Maneuver” that made it sound like Spock’s parents (or, at least Amanda) were long-since dead. She WAS a very happy Earth woman, remember? Interestingly enough, the same thing happens with Sisko’s father in DS9. And, of course, there’s that line in “Where No Man Has Gone Before,” where Spock says one of his ancestors was human. I suppose an ancestor could be his mother, but that seems like a stretch. 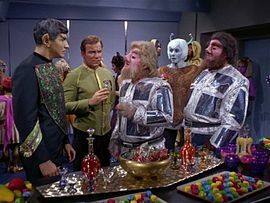 This episode really is the only time in TOS when the Federation appears (with visual evidence) to be much more than humans and Vulcans, so it’s extremely important. There’s some dumb-looking background aliens who could have been straight out of “Buck Rogers,” but it’s cool that the Andorians, Tellarites, Coridanites (not seen here) and Orions (not really seen here, either) all pop up later. This episode isn’t the first time the United Federation of Planets is mentioned. The first reference was in “A Taste of Armageddon,” after a smattering of terms like the United Earth Space Probe Agency, “Space Central” or just mentions of Earth for much of season one. But “Journey to Babel” is the first time we see the intergalactic community that’s taken shape with humans at or near the center of it. We’ll learn in “Star Trek: Enterprise” just how pivotal Earth was in the founding of the Federation.